platinum tiffany & co. bridal set ring consisting of round shape, natural diamond, weighing 1.32 carats, having a G color and VS2 clarity, according to GIA grading scale. 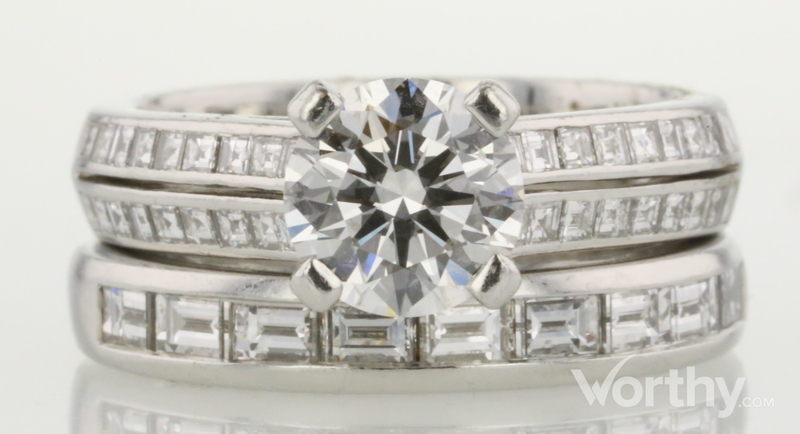 The center stone measuring 7.13mm x 7.16mm x 4.28mm and carries a GIA grading report, No. : 13578474. All surrounding diamonds are genuine with a total carat weight (cttw) of 1.36 carats. Inclusion Description: The grade making inclusions are: two small feathers located outside the table in the crown. Tiffany and Co. diamond bridal set in platinum. Complete Tiffany and GIA paperwork included in addition to the Tiffany and Co. Box.